On the other Laptop, looking for wireless name (SSID) that already had been made by the first computer and then connect, enter the password. I almost never comment, but i did some searching and wound up here Internet Sharing on Ubuntu | Hanya catatan seorang tukang. And I do have a couple of questions for you if you don’t mind. Could it be just me or does it look as if like some of these remarks appear like coming from brain dead visitors? 😛 And, if you are posting at additional online sites, I would like to follow everything fresh you have to post. Could you make a list of all of your shared pages like your twitter feed, Facebook page or linkedin profile? saya juga beli di idwebhost dulu belum ada fasilitas dns. 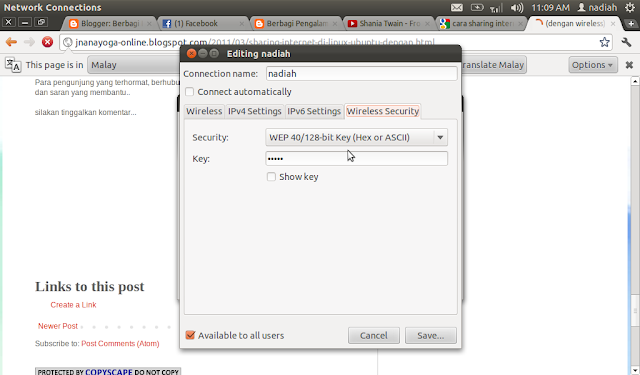 langsung cek tkp makasih mas..
article that adds to my knowledge of ubuntu, thank you.!! Apa kabar Kang.., sekarang dimana..?? ?